As a loving cat parent, you probably can’t wait to spoil your kitty, especially at meal time. In fact, if you don’t get that meal ready on time, you’re probably treated to some loud meows or pawing. But before you fill the bowl and give your cat food like usual, consider making your kitty work for her food. Hold on! Isn’t forcing your cat to work for food cruel? Well except in cases where physical health, disability, or limited mobility prevents it, it’s actually beneficial for cats to use their brains to find food for themselves. Our cute little house kitties are descended from wildcats, which makes indoor living a little difficult. In fact, living indoors is linked to health problems in cats like urinary tract issues, diabetes, and obesity. The lack of mental stimulation can also lead to aggression, territory marking, and attention seeking. According to a study in the Journal of Feline Medicine and Surgery, food puzzles can help reduce stress in cats and cause them to be less demanding of their owners. Food puzzles allow cats to use their hunting and foraging instincts and work for their food. 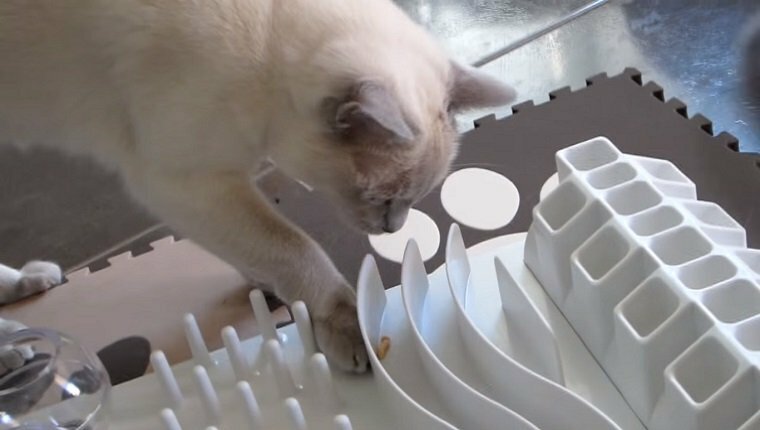 These food puzzles range from simple toys that are meant to be hidden around the house so cats can track down their food like prey to more complex puzzles that require certain actions or behaviors that mentally challenge cats. But you don’t even need to purchase a food puzzle. They’re very easy to make with egg cartons, bottles, containers, boxes, or even a paper bag you have lying around. Finding the right puzzle can be difficult, as cats are individuals with their own preferences. But through trial and error, you can find a toy that works for your cat. The study showed very positive results for cats that switched to puzzle toys to get their food. Some of the individual effects were a reduction in feline obesity, decreased aggressive behavior cause by frustration, and reduced social anxiety and fear of people. More studies need to be done to find out what other benefits there are for cats who work for their food. Some experts also believe that added mental stimulation from performing tricks can have similar effects for cats and help strengthen the bond between feline and owner. Clicker training is a great way to keep your cat mentally engaged at meal time, and the added mental stimulation can help reduce boredom and the potentially destructive behaviors associated with it. We all love to spoil our kitties and treat them like royalty. But overall, your kitty will be happier and healthier if you give them an additional mental challenge during feeding. Cats are meant to hunt, track, and forage for their food, and plopping a bowl down in front of them deprives them of using those instincts. Try making them work for it and see if you notice any health benefits within six months or so. Your kitty will thank you. Have you tried adding any mental challenges during meal time? How did it go? Did you notice any improvements in health or behavior? Let us know in the comments below!